Hi all, I just received and tested an ear-worn mic headset purchased on Aliexpress and I wanted to share my dictation results. Ever since I started getting great accuracy with my dragon dictation, I quickly moved my target to becoming as mobile as I could be while dictating. I have been using my Sony DVR icd 312 PX with my Jabra 750 headset with great results, but I wanted something even lighter and more discrete than that. I think I just found it. I ordered this ear worn mic that cost $12 from Aliexpress (https://www.aliexpress.com/item/Free-Shipping-3-5mm-Plug-Wired-Condenser-Headset-Microphone-Head-Worn-Single-Ear-Hook-Mic-For/32598134685.html) after reading that similar headsets performed well with Dragon. It just arrived and I quickly made a test with the microphone connected to my voice recorder. This is more than 98% accuracy and the words I thought were surely going to be mistaken after I dictated them came out perfect. I’m ecstatic. The total weight of the microphone and cable is 11 g (0.40 ounces) And it is 8 times lighter than my Jabra headset which is very light already. For use on my PC I simply connect it to my USB audio dongle for a clean dictation. I had to re-adjust the curve around the ear by twisting the metal into shape till I had the microphone just beside my mouth and comfortable around the ear. This may be the lightest and best microphone you could get for Dragon for this price hands down. But most importantly, It has opened up my mind to the fact even modest and wisely chosen options can work as well as the well-known and more expensive ones. I mostly use Dragon for dictating blog posts so there isn’t much dialogue for me. There is, however, the usual comma, next line, etc commands. Yes, it can make a huge difference if you have to open and close quotes regularly while speaking in the third person. But even that can become 2nd nature when you do it many times. I’ve been using Dragon since way before version 11 and for me, without a standardised English accent, it was awful. It was, however, faster than I could type for short posts and online commenting/emailing so I never really gave up on it. I struggled with an analogue headset never knowing that it was the main cause of my low accuracy until I got a USB one. It turned my dictation from night to day. 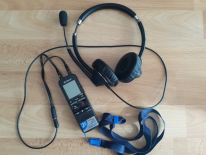 After version 13, I became a solid believer about its massive potential and started to create a huge amount of content with my good USB mic and a well-trained profile. I am now on version 15 and this software has come a long way. Accuracy is fantastic even without a trained profile as long as you have good dictation skill (you speak clearly and slowly). Dictation is mainly about this. If you think you see dictation in your future, then I will see you jump in 100%. There is something magical about it. In the beginning, I had to spend so much time going over and correcting what I dictated. In total more time than it would have taken me to just type it out. But I’m very sure that in many cases, I would not have sat down to start typing it out and this is why I’m so invested in it. How I added a 3.5mm TRRS Jack To My Jabra UC 750 USB Headset for Use With My Smartphone For Dragon Dictation. previous post: How I added a 3.5mm TRRS Jack To My Jabra UC 750 USB Headset for Use With My Smartphone For Dragon Dictation.